Summoners Fate is a top-down adventure that combines exploration, card collecting and tactical combat. You play the role of “fate” itself personified as a deity-like entity to the characters that inhabit the world - so much so that the characters “look up” at you during your turn, seeking your lead to guide them. Special characters called Summoners are particularly attuned to your presence. They are your direct link to their world. Through your Summoner, you can play the “hand of fate”, a literal hand of cards representing magical spells that you can use to rain fireballs upon your enemies or summon new creatures onto the battlefield. Developing this game is a small team of indies known as D20Studios consisting of myself (main developer/designer), my wife Kelly (marketing) and Peter Jones (artist and animator) all based in Salt Lake City, Utah. Plus, we have our fantastic art production team, Oray Studios, based in Indonesia. We're weird. What of it? Summoners Fate was inspired by games like Dungeons and Dragons, Warhammer, Hero Quest, and Magic the Gathering. I’m an avid fan of deep strategy and victories achieved using diverse teams and combinations of unique abilities and tactics. My goal is to capture the amazing feeling of creative strategic mastery these games deliver by building a vessel that allows others to share in that experience without the overhead of complex rules and large time commitment. To that end, I chose mobile phone as the primary platform for Summoners Fate: it’s tactile, fast, responsive - and you carry it with you always. That’s not to say we’re limited; our cross-platform tech will enable the game to scale to tablets, PC and Mac as well - but I love the idea that you can masterfully command an epic fantasy party using quick one hand gestures to make tactical maneuvers and blast spells. Summoners Fate is my second indie game and I consider it a spiritual successor to my first game, Hero Mages, which shared the same objective of delivering an accessible strategy experience. Hero Mages differs from Summoners Fate in that it was originally designed as a tabletop board game and then converted to a digital online game. It was entirely multiplayer, supporting up to 8 players, with a fixed set of characters and cards to choose and randomized combat with actual D20 dice roll animations. With Summoners Fate, I wanted to expand the world, diversity, and customization. Where Hero Mages had 20 characters and 40 abilities, Summoners Fate will feature over 200 characters and 400 cards for launch as well as an ever-changing single player experience (in addition to real-time and async multiplayer options). I’ve designed the content system with intent for expansion - once the game is launched, new levels and cards will be added regularly. My aim and hope is to service and please a very niche community of fans for many years to come in the future. I am a community driven developer, and seek regular feedback and requests - shout out if you’ve got em’. What’s the game-play experience like? On a macro level, you are exploring a fantasy world with your main Summoner character via a series of connected saga-style maps. Maps themselves are simple, with a handful of key landmarks - they look like pirate treasure maps. Each map is a very lightweight story intended to provide a sense of atmosphere and cryptic meaning to the encounters you have within the levels depicted on them. I want the player to derive their own story, their own meaning from the framework provided, rather than be explicit about the events and sequence. When you tap a destination on the map, it starts up a scenario. Here, the game becomes like a miniature version of a dungeon from Legend of Zelda, Link to the Past. You explore the destination one room/one screen at a time. 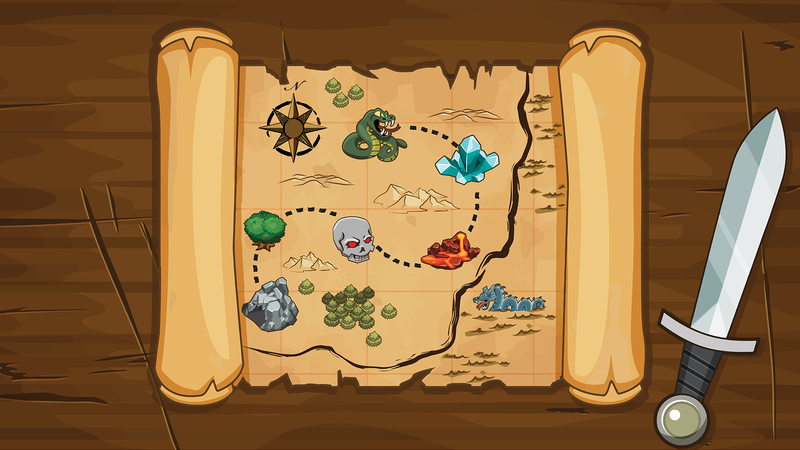 Rooms can vary in their objective (ranging from combat to light puzzles to varied game objective). Primarily, these are tactical, turn-based battles where you play out combat in a style akin to a combination of Hero Quest (taking action with each of your characters from a top-down perspective) and Hearthstone (playing cards from your hands to create additional units or manipulate the battle with magical spells). At a micro-level, the smallest “chunk” of gameplay is clearing a single room. Rooms are designed to take an average of 3 minutes to finish, making them ideal segments for mobile gameplay sessions. For players seeking a longer session, the rooms daisy-chain together seamlessly, so it’s really up to you how long you go for. What keeps it interesting is that as you cast spells/take damage/lose heroes, the results of your actions carry with you to the next room. This entails considerations on both a tactical level as well as a strategy/endurance level. Did you prepare a deck meant to win against a boss, survive rooms filled with traps, or both? While the micro gameplay experience is short, it’s by no means diluted. During early development, some of my players were initially turned off by the smaller maps and limited number of actions per character, so I worked with them to find ways to make a deeper experience with less overhead. For instance, rather than having a separate move and attack action, move and attack are combined in a single gesture. Instead of having to click a character, click a menu and click a button (phew!) you simply drag your finger from a character, creating a movement path to a desired position, and then (if desired) combine that with an attack. The path you choose is important because it determines where your character will face relative to the enemy. Attacking in the back has strategic advantage (the enemy can’t attack you back) and some characters even gain bonus damage for backstabbing. Another key was creating diverse terrain and environment that mattered by changing how units move through it or use it for cover and defense: swamp tiles that slow movement, lava that burns units, rocks that block line of sight. To take that even further, many spells are designed to interact with environment, like this “Animate Tree” spell that can transform trees into monsters. On a meta-level, you’re on a quest to collect more characters and more cards to expand your strategic diversity. I say diversity rather than “power” as its better represents the spirit of the card collection mechanic. Some games leverage leveling mechanics where your power in the game is driven more by what you have than how you play. Personally, I see the goal to collect cards in the game driven by a desire to experiment with new and creative ways to win. If the balancing goes well, I’d love for it to play like out like the rock-paper-scissors feel of StarCraft. The different races aren’t more powerful than one another, but choosing the right characters at the right time leads to victory. Beyond the single player adventures and meta-card collecting, the game opens up to multiplayer matches and eventually guild/clan competitions. That way, there’s a diversity of goals for everyone and a lot of possibilities for players to find value in their investment of the game. And that’s Summoners Fate...so far! Our Youtube channel, Game Dev Chats, is about creating a game company, game development and game marketing. It made me sad when I saw you had no Replies yet. So I just wanted to say it looks great! Your art looks nice a polished and I love the idea of playing cards during a strategy RPG. Very neat concept! Cheers! Thank you so much, Odinkong, that means a lot! I realize our game is a niche concept and won't appeal to everyone, but I do hope those who like strategy/RPG/CCG style games take a look and share their impressions and feedback. It's always helpful to understand how the game is perceived and if I could be doing better to represent it. Looking good! I like the consistent perspective towards top down for your strategy elements, one could relate to it to the magic of a board game grid experience. Overall it's looking very polished with the UI, the art, as well as the swift touch gestures from your videos. Thanks, man! I just really dig these kinds of games Top-down solved a lot of challenges for both the art production and user interface on mobile. We were considering isometric at one point. I noted that you were developing on mobile as well and I am curious how you will handle your controls to overcome the angled perspective. Then again- I never used 3D - and that certainly gives you lots of advantages to manipulate the board for viewing different angles. Anyway, we should stay in touch - I foresee a lot of opportunity to learn from each other and how we choose to implement various things (AI, controls, mechanics). Let me know when you have a build ready, I would love to check it out and give you feedback (and vice versa). 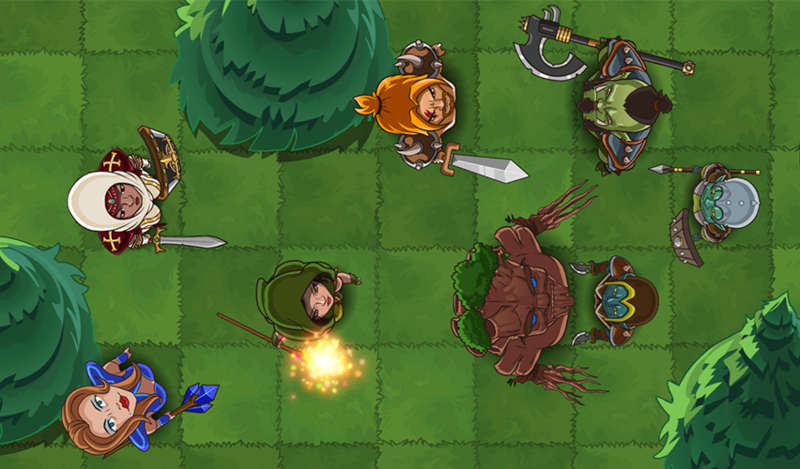 I'm also working on a tactical Rpg for android, however were actually making ours in real time no turns. I'll have a dev log up tomorrow. I was an idiot and thought you were supposed to make a new thread for each post so I did that for two weeks instead... Anyway I would love to keep in touch with both of you. We share the love of a genre. Exciting! Yes, I would love to learn more about your project and play-test/offer feedback as well. I remember playing a real-time tactics game on Android a few years back called Champs Battleground - I wonder if you've heard of it? They used cool-down timers to pace the unit abilities. It was interesting - if you attempted to move to a space at the same time as opponent, you could get blocked and sent back to your previous space depending on who actually made the move first - it was pretty intense and added an interesting feel to the genre. Curious to learn more about your design. I just checked out a game play trailer of champs. It was pretty neat, its almost like the way the way ff7 does fighting where its kind of turn based, but if you wait to long you will get penalized. However our game is significantly faster. The main difference with our game is that units attack on their own whatever is in front of them, so it really plays like an action game. I would love to show you some game play and if you google Raven's Path you will find some, but the footage I put out a couple weeks ago is a bit slower than our usual game play. I though people would want to see the simple stuff first. Boy was I wrong they want to see the fast action packed confusing crazy stuff, so I'm working on putting together a mashup of better footage for a month or so now. I'll be sure to let you know when its ready, and I would love to send you a demo when we can for feed back. Btw I love the fact that you are using mana for the cards. Your game looks like an amazing mashup of magic hearthstone and tactics. Ah, I see now! Its sort of like a constantly moving forward/non-stop action RPG. There's another game I played on Android a few months ago that had a similar structure, though it was turn based and moving along a horizontal board instead of vertical. I went through my app history trying to find it but no luck, they may have pulled it or renamed it. If I remember, I'll let you know. Anyway, looks good! I would definitely recommend changing your title name. There's a lot of content - some kind of paranormal/spiritual show/website/music album that all comes up before I was able to find your gameplay video. What do you think? Do you enjoy playing with fire? Today, I want to show some ANCIENT RUINS - environment pieces to provide a full & rich gaming experience in Summoners Fate. These will pop up in different levels of our game to add ambiance, line of sight considerations, and a place to hide...for your enemy, of course! Zaibach had interesting post today on his turn-based tactics game about his AI development, TacticsV (which you should definitely check out as well if you’re interested in games like Summoners Fate), so I felt inspired to share a few insights about my AI process as well. Summoners Fate will feature 400+ cards/characters/abilities for launch and regular content updates every 6-8 weeks for the next several foreseeable years. In my first game, Hero Mages, I had a closed set of around 40 unique abilities/20 characters, so a lot of the AI “magic” boiled down to custom scripts per behavior to ensure the AI knew how to play the right abilities at the right time and in the right order. This quickly became overwhelming to manage; this approach wouldn’t scale with the amount of content I have planned for Summoners Fate. Hence, most of the work in building the AI is coming up with creative ways to minimize/cut-down large chunks of those permutations so that the AI is only considering among the best possible options. For example, testing “sub sets” vs. complete sets (ex: test the best of the unit actions first, then test the best of the spell actions, the test whether it’s better to attack, then spell, or spell then attack) can reduce that massive trillion down to only 250. Questions/comments welcome. Also, if you’re a fellow dev working on this stuff - how are you solving your AI challenges? I’m as eager to learn as I am to share. We will have many environmental pieces for varied rooms and worlds. Stay tuned for desert, jungle, ice, dungeon, and many more world features! Goblin Champion will be one of over 200 playable characters in Summoners Fate! What do you think of the finished character art? Summoners Fate is a top-down adventure that combines exploration, card collecting and tactical combat. You control the fate of your Summoner and command an ever-changing band of companions. Defeat monstrous hordes and reap the rewards of treasures, allies, and powerful spells as you advance deeper into unknown lands. Are these chance encounters or do they connect to a greater meaning? You decide. Venture into a game without limitations. Choose your characters, choose your spells, choose your strategy. Choose when and how you play. You are in control. Summoners Fate – strategy without barriers. I don't believe that a video game is only about the finished project; if you're like me, I enjoy seeing the process of making the game - bloopers, mistakes, sketches, crazy ideas, etc. In that same spirit, here are some sketches for our Band of Bandits for our upcoming game, Summoners Fate. What do you think? We had our awesomely talented art team create the characters with and without hoods & face masks. I see pluses and minuses with each option. What do you prefer? Love the feedback! We LOVE dragons at D20Studios, and we will have quite a Dragon Race built up among our over 200 characters we have planned for our game. The art looks really nice and I like the concept! It looks like it could be a fun mobile game to play in short bursts, like you mentioned with the 3 minute rooms. Just wondering, how are you planning on doing in app purchases? What sort of things will be available to buy? Thanks, Wizered! The primary item that will be available for sale is card packs. Players will be able to buy card packs via gold or with real current. Gold is earned by completing missions and winning matches against opponents. I like this model a lot because its clean and easy for players to derive the value in what they are buying as cards directly add to the enjoyment of the game. As our game is free-to-play, we think it should be possible for players to earn cards via regular play as well. Another idea I've been considering is ability to purchase some kind of boost item (like a 2X gold multiplier and/or subscription for daily cards) that gives a nice mechanism for players to get more rewards out of their daily sessions. Since you ask, what kind of things might you expect or would desire to be able to buy in a game like this? Along with our humanoid characters, we have some fun additions that we always wanted to play in a video game. One such character is a giant, smashing tree - the Treant! He's been transformed from an immobile tree into a sentient being, and enjoys bashing his enemies with deliberate swings of his leafy branches. The great thing about him is he is summoned from any tree on the battlefield! What do you think? Would you like to play as a colossal tree creature?